Having lived in New York City for most of my life, before recently moving to Hope, NJ, I should like to report that the city is a series of neighborhoods. And more often than not they are friendly neighborhoods. Never was this more so than during Hurricane Sandy, Fall of 2012, when almost all of lower Manhattan was without power. The wonderful produce store on University Place, Agata and Valentina, delivered food from its uptown location to its downtown one, to help out us neighbors. And here's what happened more recently when I was searching for gooseberries for a photo for the upcoming Baking Bible: I called the store and spoke to Raz, the manager. He was not familiar with the exotic berry, but I assured him that I had purchased them at the store the year before, when I was testing the recipe. As it was a very short season I wanted to be sure to order the gooseberries and not miss the small window of availability. After doing some research, Rax ordered 6 baskets of gooseberries for my husband to pick up on his weekly visit to the city. Elliott arrived late in the evening with the gooseberries that were not! OMG I exclaimed--they're cape gooseberries! They were absolutely delicious raw (gooseberries are more bitter than sour cherries and need sweetening and cooking for the sugar to penetrate the skins) and I ate my way through all 6 baskets within just a few days. Back to the drawing board, Rax did more research. But I was getting desperate so I asked my new editor Stephanie Fletcher, at Houghton Mifflin, if she could run over to the nearby Union Square Farmers' Market and see if they had them. 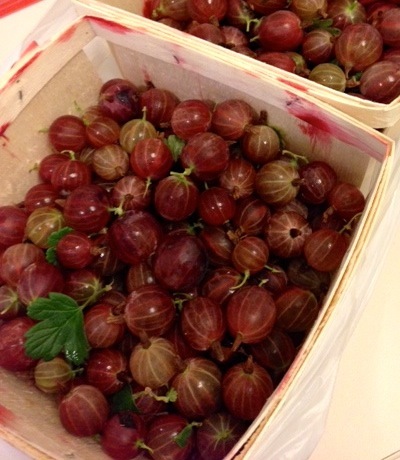 Not only did she come through with the gooseberries, she even sent me a photo to reassure me that they were the ones I had in mind. Meantime, Rax eventually found the gooseberries I needed as well. Not only did he do this without charge, he offered to ship them but luckily Elliott was able to return to the city while the gooseberries were stil at their peak of freshness. And I stemmed and froze them for our November photo shoot. Was it worth all this effort? The gooseberries are for a recipe for gooseberry crisp inspired by my dear friend Kate Coldrick, from Devon England, who sent me a photo of a darling little gooseberry pie she had made. The magic of gooseberries is that even if green (they turn pink on ripening) they become a gorgeous pink on cooking and have a most delicious flavor. I encourage you all to search them out this coming July and freeze them for when the book is published Fall of 2014 or, if you can't wait, google and you will find recipes on line.